Parole is a French term meaning "word". In the days of formal warfare, it was customary to exchange prisoners of war by a complex formula of numbers and relative rank. Often, to avoid being burdened with large parties of prisoners, forces in the field would "parole" them; that is, release them to go home on oath not to perform any military service until exchanged.1 Early in the Civil War, it was discovered that many paroled men would disappear into the civilian population, not to be found when ready for exchange. So keeping them under military control until exchanged and returned to their units became imperative. On May 1, 1863, the Federal government signed a lease with Charles S. Welch and Ann Rebecca Welch, his wife, for the use of their 250-acre farm outside of Annapolis, at a rent of $125.00 per month. The new site was near the Annapolis-Elkridge railroad. Camp Parole was gradually transformed into a way station for paroled men and exchanged prisoners moving to their homes or to other camps. Many remained as hospital patients until they died or were able to travel. In August 1864, Lt. General U. S. Grant ended all exchanges of prisoners, an action militarily sound but with disastrous results for Union prisoners held in the blockaded and impoverished South. By June 21, 1865, Captain John Power, in charge of the Camp, was writing that he expected "the business of the camp would be closed in 2 or 3 weeks. "7 He suggested that Quartermaster stores, including horses, wagons, carts, ambulances, harness, lumber, policing tools, barracks (all military surplus) should be sold at public action. 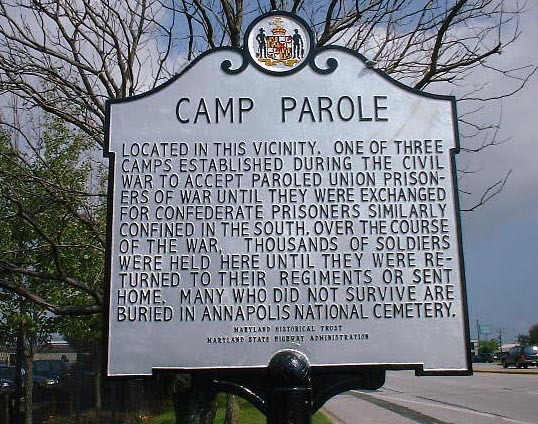 Camp Parole was vacated by July 18, 1865. 1. Marshall Andrews. Letter to the Editor of an Annapolis newspaper, published September 21,1970. 3. "In Salute to Camp Parole." In The Annapolis Spectator, published by Woodward & Lothrop, 1964. 4. Ibid. 5. Marshall Andrews. Letter to the Editor of an Annapolis newspaper, published September 21, 1970. 6. "In Salute to Camp Parole." In The Annapolis Spectator, published by Woodward & Lothrop, 1964. "On July 12, 1862, the President, through the Secretary of War, authorized Major General John A. Dix at Fortress Monroe "to negotiate a general exchange of prisoners with the enemy." The ensuing cartel, signed by General Dix for the Federal Government and by Major General D. H. Hill for the Confederate States of America, was announced in Adjutant General's Office General Order 142, September 23, 1862. The articles of this agreement stipulated a detailed scale of equivalents as the basis for exhanges�'man for man and officer for officer,' but a commanding general or admiral, for instance, was the equivalent of 60 privates or common seamen. The cartel also dealt with the problem of civilian prisoners and the actual mechanics of parole and exchange, and it prohibited further military service of released prisoners of war. The negotiators did not anticipate that large numbers of prisoners of war would be held either in the Confederacy or in the North, and they made no provision for the uniform treatment of captured soldiers. "Adjutant General's Office General Order 187, November 15, 1862, detailed Major General Ethan A. Hitchcock as Commissioner for the Exchange of Prisoners. Until early in 1863 the system of exchange agreed upon in the cartel apparently was respected by both sides, but the unwillingness of the Confederacy to exchange 'man for man' and to agree to the exchange of colored troops or their white officers led to its breakdown. "Late in 1864 Secretary (of War) Stanton designated Major General Benjamin F. Butler at Fortress Monroe to negotiate for and effect prisoner exchanges; and Commissioner Hitchcock for a time, as he reported to Stanton, "had very little to do with the matter of exchanges." Butler, indeed, conducted his work in this field under the title "Commissioner of Exchange," and Stanton authorized other commanders "to open communications with the enemy, and to effect exchanges whenever the could be made on equal terms." "Major General Ethan A. Hitchcock served as Commissioner for the Exchange of Prisoners from November 15, 1862, to November 3, 1865, when he succeeded Brevet Brigadier General William Hoffman as Commissary General of Prisoners. CAMP PAROLE, Annapolis, Md., August 5, 1862. The order which was recently published by the War Department requiring that all paroled prisoners belonging to the New England and Middle States should report at once at the Camp of Instruction at Annapolis, Md., has been complied with by a large number from these sections, and they are now anxiously waiting the further action of Government, and are desirous of learning as quickly as possible what disposition is to be made of paroled prisoners generally. At the time this order was issued it was supposed that every necessary preparation had been made for the proper accommodations of all who should report at this camp, and accordingly many left home with such an impression, and came here expecting to find a state of affairs different from those now existing in reality. It is deemed advisable, sir, to call your serious attention to the highly important tact that there are now a great many here who have not yet entirely recovered from the effects of the hardships which were suffered while in Southern prisons, and who will prove only a burden to the Government if continued in the service, while there are a great many also whose constitutions have become completely undermined and who are now no longer capable of enduring the privations incident to the line of a soldier. All such have a right to demand their unconditional release, and it is asked in common humanity that a more through and faithful examination than that which was recently made may be instituted for the purpose, and that all thus unqualified may be at once mustered out of the service. Samuel E. Hodgkins, William Duffie, representing Massachusetts volunteers. Any response to this communication will be forwarded to William Duffie, Second Massachusetts, company of paroled prisoners, Annapolis, Md. CAMP PAROLE, Annapolis, Md., November 6, 1862. [Indorsement.] Approved. The condition in which these men come to this camp is deplorable. Some come here in such a condition that we have to carry them on stretchers from the steam-boat and cars. All such men should be put in hospitals where there is every comfort and care that their cases need. Washington, D.C., February 24, 1865. COLONEL: Miss Clara Barton, who will hand this to you, desires to be the means of informing the friends of prisoners who have been in the hands of the enemy of their fate, as far as it can be learned by inquiries of those who are now arriving at Annapolis on the parole from the South. Please permit her to post notices in the barracks asking for information concerning such prisoners as she may have occasion to inquire for, and if it is practicable to give her any information from your records without interfering with the necessary course of business, I request that you will communicate such as she may desire in general terms, not giving particulars on which to base a claim for pay or allowances. Report after trial of a few days how far these instructions can be carried out without inconvenience and wait for final approval. Washington, D. C., February 24, 1865. COLONEL: Your letter of the 17th instant relative to the proper distribution of prisoners under your charge has been received, and I am directed by the Commissary. General of Prisoners to inform you that your understanding of the letter of instructions from this office dated June 29, 1864, is correct. Prisoners confined for civil offenses not connected with the rebellion, as well as those held under the special order of the general commanding the department, are not political or state prisoners, and should not be reported to this office; nor is it expected that any arrested simply on suspicion and against whom there are not apparently well-founded charges of disloyal acts, will be so reported. Many are arrested under circumstances which render their detention proper, but a little investigation proves their innocence and entitles them to their release. The investigation in such cases should take place before reporting them to this office. All prisoners not included in the above classes should be reported to this office, and all parties reported under these instructions should be forwarded at once to Saint Louis and thence to some Northern prison, and not held at Saint Joseph or other points in Missouri. Asst. to Com. Gen. of Prisoners.